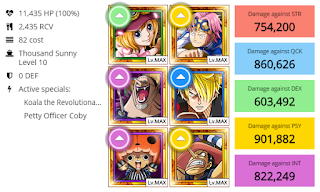 OPTC Guideblog: Fortnight Review: Halloween Strawhats Twilight Party! Fortnight Review: Halloween Strawhats Twilight Party! Not really much of use. Turn delay Luffy or Franky, depends where you stuck most. Rainbow crew is a must! There are all variety of enemies. If you dropped a Vampire Chopper already you can make use of his special. Due to Crocodile's attack pattern, it can be suggested to kill Crocodile within 6-Turns or it will be quite difficult to skin the Croc. 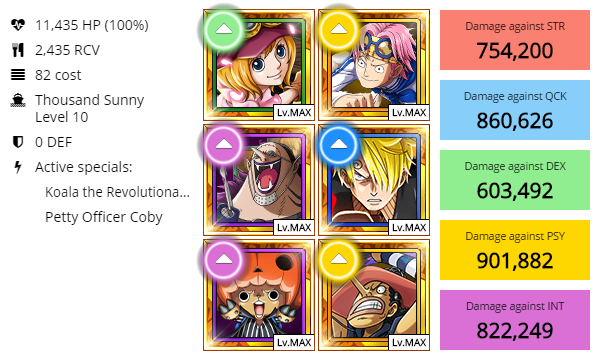 Early free to play possibility, If you do not have Zeff, Coby is fine to work with. Use your specials correctly and have a nice amount of RCV when using Koala friend.